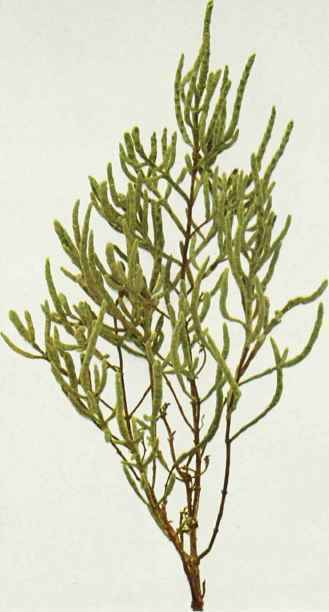 A fleshy, glabrous annual plant, 4 to 20 inches high, usually erect and much branched, with opposite, ascending branches, their joints two to four times as long as thick. Leaves reduced to mere scales. Fruiting spikes 1 to 3 inches long. Flowers three at each joint, the middle one as high as the lateral ones. Each flower consists of a fleshy, obpyramidal three-toothed calyx, two stamens and an ovoid ovary. Seed inclosed by the spongy fruiting calyx. Common in salt marshes along the coast from Anticosti to Georgia, and at the head of Onondaga lake.